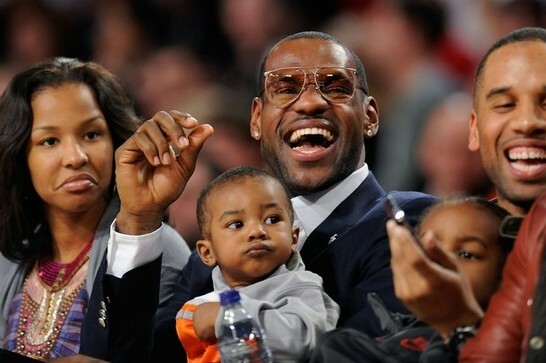 BHR HollyWood Reports Are LeBron James and the mother of his two children, Savannah Brinson, on the outs with each other? Could be. Observers are watching and here’s the latest. Brinson, 26, who’s been in a relationship with James since high school, has not been seen with him in weeks. Specifically, she missed his two of his important, high profile milestones, according to Jose Lambiet’s Gossip Extra. She wasn’t with him at last weekend’s all-star game in Houston, and at the world champion Heat’s congratulatory visit to the White House in January. What’s more, I’m told by a source that the couple briefly planned to get hitched sometime last summer, seven or eight months after the New Year’s eve party when James asked Brinson to marry him! Brinson, the mother of James’ sons LeBron Jr., 8, and Bryce, 5, even went to a New York fashion show to shop for a wedding gown, according to photos of her at an Ines di Santo fashion show in April. James proposed at his 27th birthday party at the Shelborne South Beach. A pear-shaped diamond was involved, and photos of the bauble were tweeted to the world. James’ summer, however, got busy with NBA championship celebrations and the Olympics. I’m told several news organizations were angling for exclusive access to the ceremony but talks broke down abruptly with no explanations sometime in late summer. No one in James’ tight-knit camp’s talking, including one of LeBron’s lawyers reached by Gossip Extra. Meanwhile, several urban gossip sites reported Brinson was the only Heat significant-other not in attendance when the Heat visited President Barack Obama Jan. 28in D.C.
And last weekend, according to Brinson’s own Twitter feed, she was “roughing” it on Catalina Island off Los Angeles with girlfriends while James starred in the all-star weekend.